The unique gel formulation of Gluma Desensitizer PowerGel allows for better control and accurate placement. 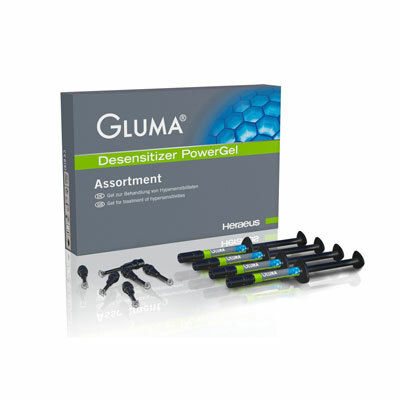 Building on the proven effectiveness of Gluma Desensitizer, Heraeus Kulzer has developed Gluma Desensitizer PowerGel. According to the manufacturer, this 1-step gel provides the user with more control and accuracy during application. Heraeus also incorporated a green-color indicator for better visualization during placement and removal. The no-drip formula helps to minimize contact with soft tissue. In addition, the gel can be used with all bonding and restorative materials in any situation. had several patient to say they could tell a defference immediately after rinsing it. the only thing i don't like it having to dry the tooth, which causes sensitivity & isolating the tooth.